Hibaldstow Village Hall Playing Fields on Station Road offers ‘Street Sport’ Multi – Sport. Session is suitable for ages 8 – 18 years. Please visit the website www.northlincs.gov.uk/leisure/community-sports/community-sports-youth-8-to-18-years for more information. Take a look at the Parental Consent Form which must be filled in before a child can take part. North Lincolnshire Council will make every effort to deliver activities as published. However, we reserve the right to cancel or suspend any activity without prior notice if severe weather conditions or circumstances beyond our control put the health and safety of children or staff at risk. This may include cancelling activities at the start or during the session. Westcliff Youth Centre on Cowper Avenue offers Planet Youth. Check us out on Facebook, because Planet Youth gives you the activities and space to have a good time. Activities include arts & crafts, table tennis, pool, XBox, Wii, Playstation 2, film nights, drama and dance. To discuss your child’s individual needs please contact Ancholme Leisure Centre. Epworth Community Wellbeing and Youth Centre offers ‘On Target’ Street Dance. This session is suitable for ages 8 – 19 years. Please visit the website www.northlincs.gov.uk/leisure/community-sports/community-sports-youth-8-to-18-years/ for more information. Appleby Frodingham Works Athletic Club on Ashby Road offers ‘On Target’ football. Session is suitable for ages 8 – 19 years. Please visit the websitewww.northlincs.gov.uk/leisure/community-sports/community-sports-youth-8-to-18-years for more information. Brigg Recreation Ground on South View Avenue offers ‘On Target’ Girls Only Football. This girl can play football, learn new skills and inspire each other to get involved in sport. Join us and be part of the movement to get more girls playing sport. Suitable for ages 8-19 years. Crosby One Centre on Digby Street offers ‘On Target’ Street Dance. The Pods on Ashby Road offers ‘On Target’ VX (Rock it Ball). 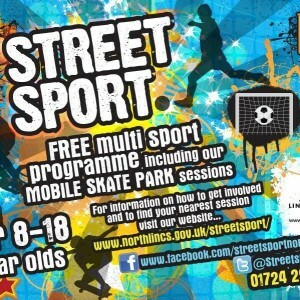 Please visit the following website www.northlincs.gov.uk/leisure/community-sports/community-sports-youth-8-to-18-years for more information. The Pods on Ashby Road offers ‘Street Sport’ Multi – Sport. Ancholme leisure centre on Scawby Road in Brigg offers Snaps Club for children and young people with an additional need. This is a group swimming session especially for children and young people with an additional need. For more information call 01652 652 031.